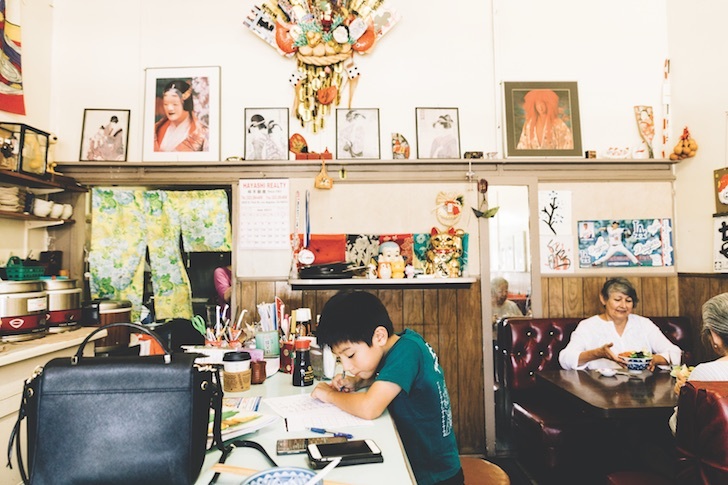 A restaurant like Musso & Frank’s can transport you to a different era, but a tiny one like Otomisan in Boyle Heights takes you to a lost world. A few frayed Japanese lanterns hang on the weathered exterior that looks out onto 1st Street, just east of Mariachi Plaza, and a sign on the door reminds anyone coming for the crackling tempura that the place closes nightly at eight. Noren curtains separate the kitchen from a compact dining room, where three tufted maroon banquettes and five backless stools frame a slightly dinged counter. When the place opened in 1956—the original name was Otomi—the surrounding few blocks were an Eastside Sawtelle, a Japanese American enclave abuzz with grocery stores, churches, temples, social clubs, and restaurants. In the age-old flux of Boyle Heights, most of those businesses have given way to Latino ones, but Otomisan has become something more meaningful than a holdout; it’s a connecting point for those who appreciate a carefully arranged salmon chirashi bowl and the comforts of a good combo platter with a breaded tonkatsu cutlet, salad, and cut nori-wrapped roll.